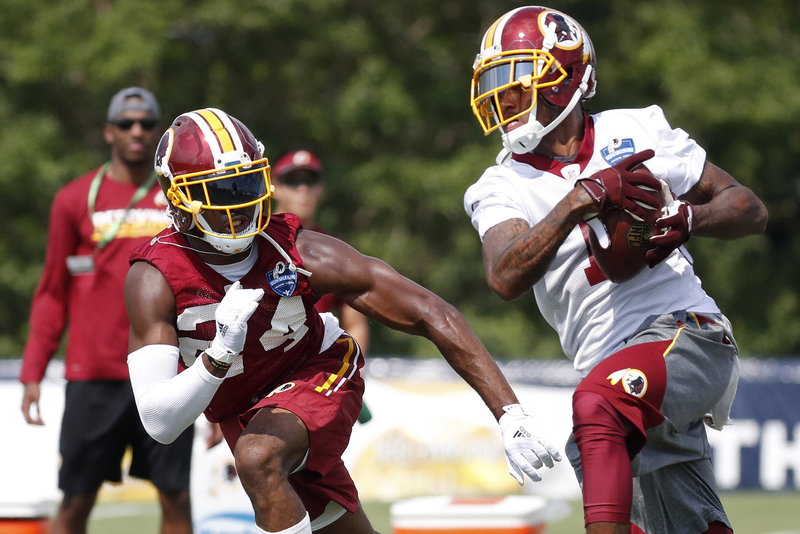 The spirited cat-and-mouse battle between All-Pro cornerback Josh Norman and star wide receiver DeSean Jackson was the highlight of Washington Redskins camp last week. And although Jackson clearly won the initial matchup – entering his ninth season, he still has fear-inspiring speed – the team was no less excited about its biggest offseason addition. After making Norman the NFL’s highest-paid corner, the Redskins are banking on him to help transform their defense, which, at least statistically, has been among the game’s worst for years. With Washington potentially having to face superstar wideouts Dez Bryant and Odell Beckham Jr. (more on Norman-Beckham later) in four NFC East division games, Norman will have plenty of opportunities to earn his big paycheck. Washington Redskins wide receiver DeSean Jackson (L) catches the ball in front of Redskins cornerback Josh Norman (No. 24) during drills as part of afternoon practice on day one of training camp at Bon Secours Washington Redskins Training Center. But a team’s secondary is only as good as its front seven. Until signing with the Skins, Norman’s four-year career was spent with the Carolina Panthers, who have one of the NFL’s best groups of defensive linemen and linebackers. The Redskins aren’t in the same league defensively, and they’ve already suffered a major loss: outside linebacker Junior Galette is sidelined for a second straight season because of another Achilles tendon injury. The Redskins need someone to provide the productive edge rushing they expected from Galette. Without it, their major investment in Norman may not pay off. Washington raced to sign Norman, 28, after Carolina rescinded his franchise tag. The Redskins also gave Norman $50 million guaranteed. It’s easy to understand their thinking: Norman is coming off a season in which he scored two defensive touchdowns, tied for the most in the league, and ranked fifth with 15 pass breakups. It helped that he played with other rock stars. On defense, the Panthers finished sixth in the league. Their front seven combined for 42 sacks – the NFL’s fourth-highest total among that group. In 2015, three All-Pros played in front of Norman: inside linebacker Luke Kuechly, outside linebacker Thomas Davis and defensive tackle Kawann Short. In comparison, the Redskins ranked 28th on defense. Washington’s front seven had 36 sacks, tied for 13th in the NFL, and the team had no All-Pros or Pro Bowlers up front. In three of the past six seasons, the Redskins have ranked 28th or worse on defense and haven’t cracked the top 10 since 2009. Last season, the effectiveness of the first two levels of the Panthers’ defense enabled Norman to focus on one area of the field, according to ESPN’s Stats & Information. Of his 1,021 snaps, Norman lined up out wide on 964 snaps. No one in the league played out wide more than Norman. For Norman, his comfort level out wide combined with a strong pass rush was a winning formula. It couldn’t have worked out better for Norman, former Redskins Pro Bowl linebacker LaVar Arrington said. “The reason why a Josh Norman or a Richard Sherman or any corner is able to have a great year is because quarterbacks are forced to make quick decisions,” said Arrington, now an NFL Network analyst. Washington Redskins corner back Josh Norman (No. 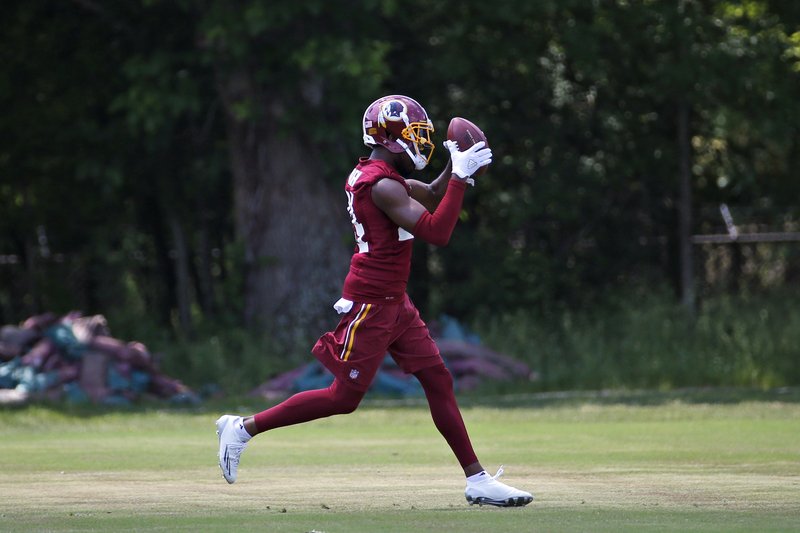 24) catches the ball during practice at the team’s NFL football training facility at Redskins Park on June 1, in Ashburn, Virginia. “Cornerbacks play with a lot more comfort if they know that an offense doesn’t have enough time to take the top off of their defense. Now, if you don’t have that type of confidence, you start thinking a lot. The Redskins get it. They’re hoping that second-year outside linebacker Preston Smith, who had eight sacks as a rookie and appears to have matured since last season, takes a big step forward opposite the steady Ryan Kerrigan. The defensive backfield is counting on them. Which brings us back to Norman and Beckham. During a game in December, Norman and the New York Giants’ quick-tempered All-Pro got into several post-play dustups. Beckham has continued to run his mouth, telling GQ magazine that Norman was relevant only because of him. “I guess if a guy talks about you that much, you must be doing something right,” Norman said. “He’s talking about me, but I am not talking about him.” The Redskins and Giants meet Sept. 25 and Jan. 1. With Beckham and Bryant of the Dallas Cowboys on the schedule, facing Jackson in practice should help Norman stay sharp. During their first battle, Norman, clearly concerned about Jackson’s ability to stretch the defense, was driven back repeatedly while guarding against the deep ball. Norman also struggled with his technique off the line – he got twisted – while trying to develop a plan against Jackson. Then it should be for the Redskins, too. They’re paying Norman to be great. Anything less won’t be good enough.